Well, I knew it had to happen. I'm sitting here, working hard on new patterns, and there sits Mario, alone, waiting, occasionally tapping his foot and staring me down. Ok, ok... I get it! You want Luigi, right? Well yes, he did... so being a good little doll-maker, I obliged him his request. Here's Luigi... companion doll to my Mario Plushie. He's somewhat like Mario in construction, but obviously there are some differences. Read the pattern through before starting to see where the changes are. ch 12, slip stitch in 2nd ch from hook and next ch, hdc in next ch, 2 dc in next 2 ch, dc in next ch, 2 dc in next ch, hdc in next ch, slip stitch in last 2 chs. F/O weave in ends. using sewing thread, pinch the middle of the mustache and secure with thread. Attach green yarn to any of the 'free loops' inside of last round of stitches in hand. Row 1: ch 14, sc in 2nd ch from hook, ch 3, * sc in next ch, ch 3 * (repeat from * to * to end of chain) end with sc in last ch. Sew head to neck opening. Sew hat to top of head as shown, giving a slight tilt backwards on the head. Sew the 'hair' to the bottom of the hat at the back (see the photos). Nose is sewn centegreen on the face with the brim of the hat, but a little lower on the face. Mustache is sewn under the nose much like the hair was at the back of the head. Luigi and Mario Brothers are copyright Nintendo. This pattern is an original pattern by Linda Potts (September 2009). Please do not claim this pattern as your own. If you wish to share this pattern, you may link to this pattern but please do not reprint it on your site or publish on any cd or collection. You may keep a copy for your own personal use but you may not sell or distribute it, or sell items made from this pattern. Photos are also property of and copyright Linda Potts. I was just showing my husband your work a couple of weeks ago and the first thing out of his mouth is "What? No Luigi?" I am going to have to drag him back over to the computer to show him that you made the little guy. I am so excited to try these! I have never tried to crochet anything like this before. This may be an obvious question, but could you clarify what "Magic Ring" is in all of the Rnd 1's? It's a great method of beginning a crochet in the round piece. Some great written instructions are here: Right-Handed Tutorial (she also has one for southpaws too linked on that page. I don't get to visit blog as often (stupid having to work at work now) but I love seeing your new projects pop up on my sidebar all the time. My 6 y.o. said that you are "an awesome crochet lady" and I agree. Your Luigi is amazing. Thanks so much for him. Thanks for all of your wonderful Mario patterns. Oh my gosh! He's so awesome ahaha. You continue to amaze me; I've been watching your stuff for a while and I love all of it! You're really talented. I'm also amazed at how fast you can whip out patterns. Man! Maybe Peach and Daisy will find their way eh? Jk jk. lol, my husband was just saying that all she needs now is to give them Yoshi and they are set. But I showed him the Luigi and it put a smile on his face. YAY! You're so amazing! This one is going in my list and I'll be linking as well. Thanks SOOOO much for sharing these fantastic patterns. I seriously think I love you lol! Your patterns are so spot on...better than a lot that I've found. And free! How fabulous is that? Thanks to you, I'm going to be able to do some Pokemon plushies for my 3 boys for Christmas. They absolutely love looking at your work. Everytime you add something new, they ask me to make them one. Each lol. I just want to thank you for the patterns. You are truly talented, and generous to boot for sharing your ideas. You're very welcome! The whole reason I started this blog was because I went looking for good patterns to make for my four kids, and couldn't find any that I (or the kids) really liked. The kids are extremely picky about things (i'm a perfectionist myself, so I guess they come by that trait honestly :) ) and so I started making the dolls for them. do you have any plans for maybe a Pontyta pokemon? Bigger question can you make a Yoshi? I'm in love with yoshi and would love to make one. I just found you via Google Reader and am so super excited!!! I've been thinking about creating a Mario and Luigi duo for a while now but have never gotten around to it. These are fantastic! I LOVE that you posted patterns too so I don't have to go to all the trouble of creating them for myself. My brother would LOVE these! I am forever going to be following this fabulous site. Your stuff is great! Thanks for sharing! All my boyfriend wants for Christmas this year is Luigi. Your pattern just ended my nightmares. I was so excited when I found it that I started, and I'm working on his body now. I've decided that I want to make his cousin Mario, and was wondering if you had any plans of making a Princess Peach that I could make for his girlfriend/my best friend. I have found a few online, but none are the quality of your patterns. I think the trio would be the best Christmas present ever! Thanks for the pattern,... but can I just buy these from you? I have to have them! I love them! Hey thanks for all the patterns! It's sooooooo nice of you to make them free! I was just wondering if you would make Princess Peach and/or Princess Daisy? That would great. Nice patterns! 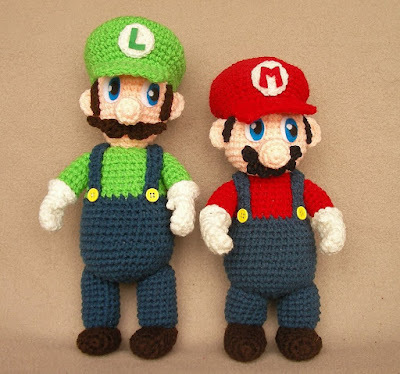 My brother wanted me to make crocheted Mario and Luigi heads, and this is exactly what I imagined! Now I don't have to make my own pattern. Thanks a million!!! These are the BEST patterns I've seen out there and it's FREE! Much appreciated-Thank You Thank You Thank You! Muitop bonito e original parabéns! Love it! You made my WEEK! My husband has always wanted me to crochet him some Nintendo stuff...and now I can! :) Thank you! There are no restrictions on printing, so it may be either in your settings on your printer, or you may be somehow highlighting a photo before hitting the print button. You should be able to print the entire pattern (including the pictures for reference) as you see it on the computer screen. Gracias por compartir sus patrones, a mis nietos les va a encantar estos muñecos. I tried this once before. Ok, I just need to know what you mean by "free loops". The pattern is great. Hope to make many! Thank you so much, I haven't been on the computer last few days and I need to get this done. Grandchildren are soo demanding and grandparents just can't say no!Thanks again!!!!! Your patterns are incredible! I have a grandson with Aspergers Syndrome who adores Mario and Luigi. I'm not an expert at crochet, but hopefully can follow directions. Both Mario and Luigi Plushies would be cherished by him if I can make them at least look similar for him for Christmas. Thank you! Another awesome lil plush character! i'm going to enjoy making them both. thanks so much for sharing your wonderful designs with all of us!! Would like to know what the magic ring is? You have some excellent patterns, and I liked them so much that I linked to this one in my latest blog post. I just wanted to let you know I linked you out and gave you credit as well. I hope it brings you some traffic from my readers. Blessings to you and here is a link to the post if you want to see it. First of all, wow! Thank you for sharing such a great pattern. Im having real troubles with the hat. And I think its gonna be the same with the face. So, I have my 16 sc in round two. But if I sc in next sc, and 2sc in next sc, i end up with 32sc plus 1 (the first sc in first sc). The numbers between the ( ) are incorrect? What am I doing wrong? Next round 4 will be, Sc in next sc (that's 2) and 2sc in next sc... I'm gonna end up with 64 plus 2! Round 5, sc in next 3 sc (3sc) and then is 40? So what Im guessing is, you're not counting the first sc, and the numbers in the () are the 2sc in each sc? But you don't get to the beginning right? I'm sorry I'm a beginner (and don't speak english very well) and I'm all lost, but I really really want to make this! Thank you once again! You genius! sc in the first sc, 2 sc in next sc, sc in next sc, 2 sc in next sc.. repeating that around. Same for rnd 4 and all the other rounds worded like that, you repeat the original sequence around. Thank you so much for answering (the blog is so old i didnt think you would). I did it! Lol. Its so beautiful, everybody wants me to make them one! You are a genius, you are making people happy. 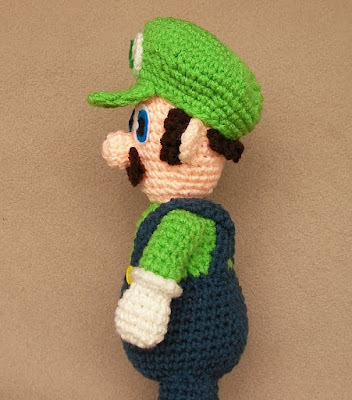 It's a long shot, but since you're so creative and apparently such fan of Super Mario, could you maybe - possibly - please please pretty please create a pattern to crochet Yoshi? My friend is a big fan of the green little dragon (or whatever species Yoshi is), so it would make for a great birthday gift. Tausend Dank für die schönen Anleitungen.Mario habe ich fertig.Er ist der Favorit meines Enkels.Hatte etwas Schwierigkeiten ,da mein Englisch nicht so gut ist.Würde dir gern ein Foto zeigen.Wie? you are amazing!!! i cant wait to get all the yarn i need to try these out! my 3 boys are going to love them! they play mario all the time on wii, oh this is going to be soooooooo fun!! thank you for making them free! I've already made Yoshi and Mario. Now I'm working on Luigi, but I've had a problem with the brim of the hat being too floppy. Do you have any tips that will elevate this? I love your plushie toy designs! They're really great! I'm having trouble with the hat...I have completed Rnd 6 (48) but am not sure how to complete Rnd 7 (and so on). If I sc in the next 11 (I have 37 left in the round) and then 2 sc in the next sc I end up with 85 in the round. What am I doing wrong? Thanks! I am making Mario. I haven't encountered any problems except with the sideburns. Do you repeat row l two times and at the end of the row do you turn? This is my first attempt at making a crochet amigurimi and your pattern is easy to follow! I'm working on the hands and arms with the thumbs. My question is are both right and left hands/arms made the same way? In your pattern you did not say to make two of the hand/arm like you did with the ears. Yes! 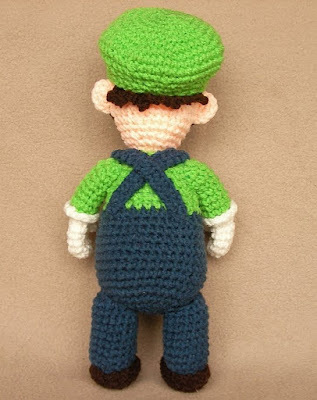 when you make a Mario, you should make a Luigi too...I knit a Mario to my son years ago and he asked me for years to make him a Luigi...So I decide, before he will be to old too, to make a Luigi. Thanks for your nice pattern! You save my life loll! Absolutely wonderful patterns! 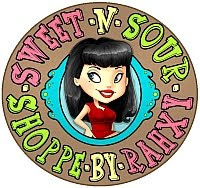 Thank-you so much for your generosity in sharing your patterns and your amazing talent. hey! thank you for your patterns! the page is great. I had one question about Luigi and Mario dolls, have been making more of your patterns and all are great, especially Sonic, but seems that Luigi and Mario are super tiny dolls. So m questions is, how big are the dolls in these pictures? i tried it with thicker yarn, but it didn't help much. thank you in advance! The dolls are 8-9 inches tall. I use Redheart Super Saver yarn and a USG (4.0mm) hook. Hello! I am so grateful of your patterns, thank you for sharing your designs (which includes your time) with us. 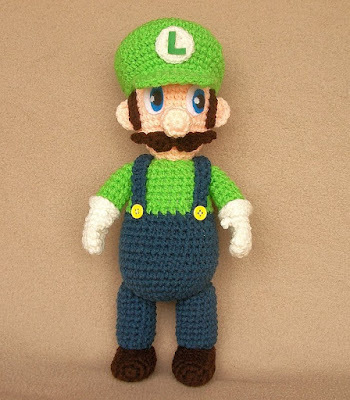 I am making this Luigi Plushie for my grandson. I have almost all the pieces done. I am doing now the feet and encounter a problem that hopefully you will help me with. Round 10 ends with 14 stitches, so on round 11 you say sc in next sc, dec over next 2 sc (8). This is the way I understand: I sc in the next sc, then I dec twice (next 2 sc), but at the end I have left one stitch and if I sc in that stitch I will have nine stitches and not 8. Please help? Thank you so much for your help and again for all your patterns. Could you make a yoshi to go with mario and luigi but small enough so they can ride him? can you make a yoshi to go with them but small enough so they can ride him? PLease that would be awesome! Does anyone know how tall this doll is? I need to make a male doll for a show I am in and need it to be at least 15-18" tall.